Along with politics and religion, marriage is one of those topics that can drive even the most agreeable of friends into vehemently opposed opinions. Jewellery and product designer Josien Pieters seems to be taking a very grown-up view. Her award-winning design for the ‘Reality Check’ wedding ring may be full of symbolism, but at least it provides the owner with the complete kit necessary for the full timeline of a marriage; for better or for worse. Fitting together a bit like a mechanical toy or plumbing system, the engagement ring – symbolized by the butterflies one feels in the first throes of love- acquires a cage, a nest in which to settle. 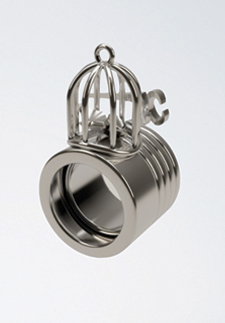 Fortunately, the ring also comes equipped with an add-on featuring mini pincer cutters; the equipment necessary for cutting the bars of the cage when things get really bad and divorces looms. Cynical or realist? I guess that’s ultimately for the potential client to decide. 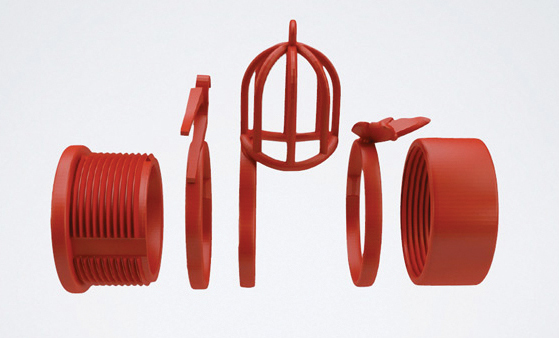 The ring was produced in response to a Freedom of Creation competition brief that saw Pieters walk away as the winner in a large field of budding talents. Currently produced in striking red polymide (a stainless steel version is on its way), it is now also available to less romantic brides and grooms from FOC’s online store.